Using hose repair clamps to fix broken hoses. Inevitably, hoses spring leaks or get run over and sliced up by the bushhog. When this happens to us, we put the broken hose next to the cold-frames by the greenhouse as a signal that it needs attention. Then we wait for the right combination of desperation (need for another good hose), spare time and “ideal hose-mending weather.” When it is disgustingly hot, the hoses become more flexible and easier to repair. We gather the kit. 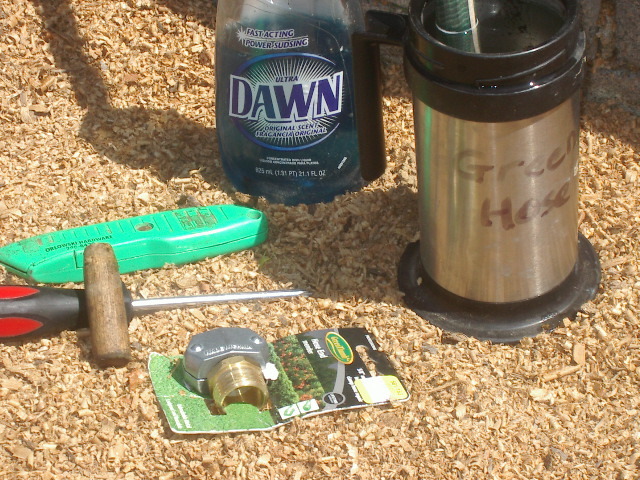 Hose repair tools: repair fitting, sharp knife, Philips screwdriver, wooden dowel, dish soap and unbreakable insulated mug. 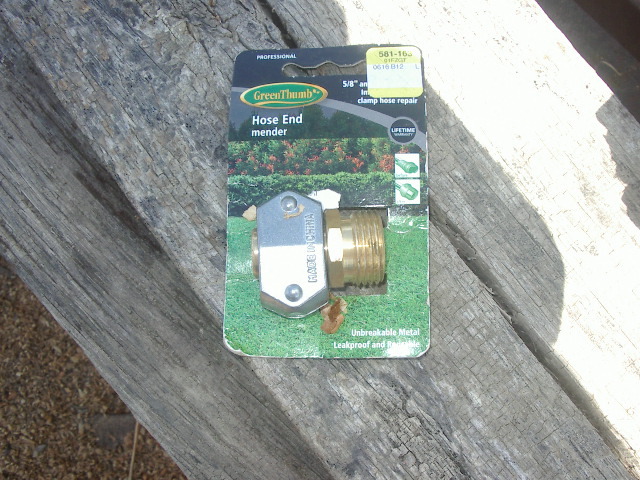 We always buy the heavy duty all-metal repair fittings now. If they last longer then the hose, we simply remove them onto another hose needing repair. We find that the threads on the plastic repair ends wear out, leading to leaks, and the ends sometimes just break off. The metal ones save frustration and are well worth the extra cost. If you are replacing an end fitting, be sure to get the right kind, so-called female or male fitting (with the threads on the inside or the outside.) 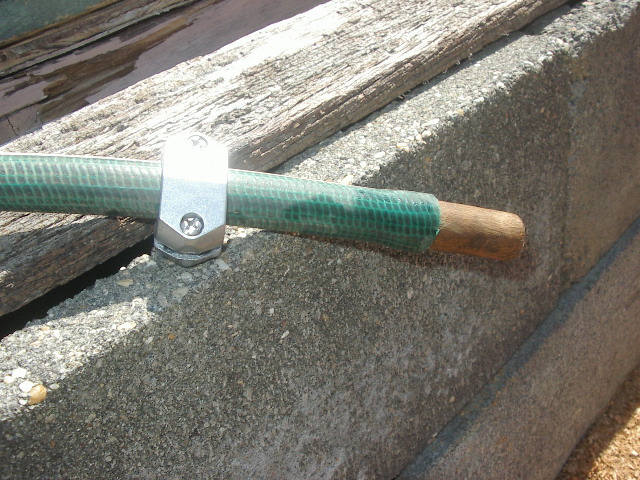 If you are splicing in the middle of a length of hose, get a connector with two clamp pieces and a double-ended insert. 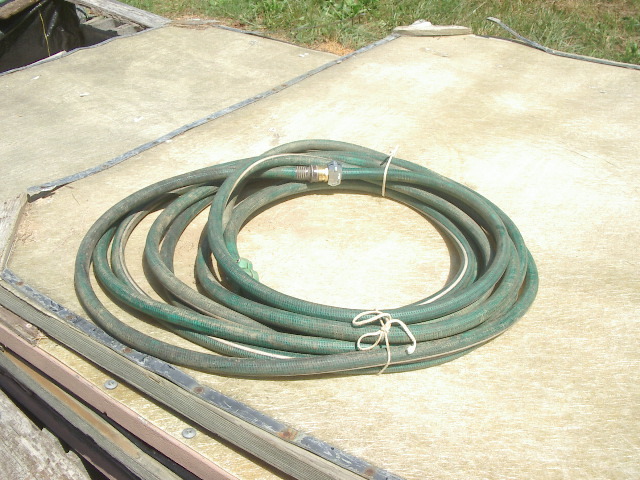 You can of course, permanently join two previously separate hoses to make one good hose, using a connector, or divide one broken hose into two shorter hoses using end menders. We sometimes do this if we are running short of spare repair fittings, just to get back in business. Also note that short lengths that fasten onto faucets are a handy thing to have, for filling buckets and cans, so if the break is near the female end, you might just make one very short hose and one almost-full-length hose. The next task is to make clean cut ends on the hose with a utility knife, to ensure the fitting will be snug and not leaky. Boil some water and fill an unbreakable insulated mug. Stick the hose ends in the hot water to soften. While that’s happening, loosen the clamp screws on the fitting. You don’t have to take the screws all the way out. You can just loosen them enough to slide the clamp on the hose and up beyond the end you are working on. 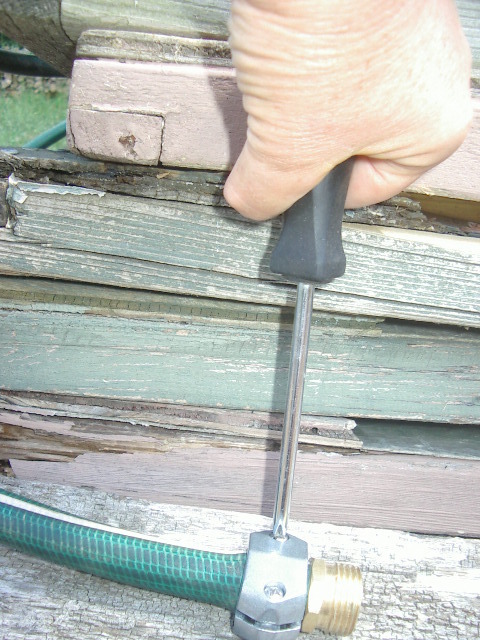 Push the wooden dowel into the heated end of the hose to stretch it out. While the hose is softening in the water, lubricate the end of the repair fitting with dish soap. Honest, this makes a lot of difference. 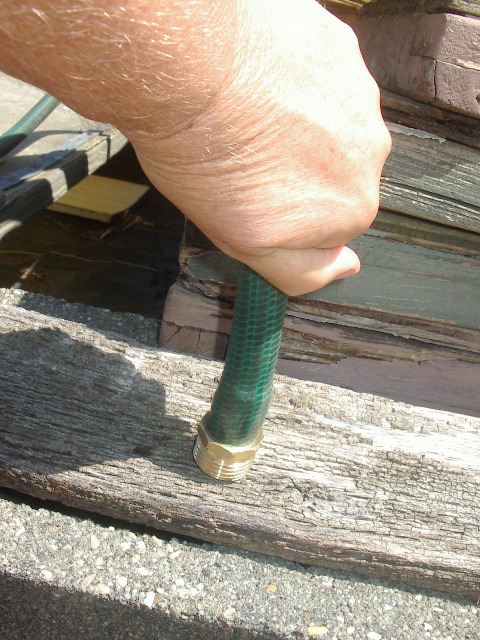 Take the hose end out of the water and push the wooden dowel in the hose end to widen it. Some hoses are more flexible than others and don’t need this step. Pull out the dowel and push in the soaped-up fitting, Push firmly until the fitting is fully seated. If it helps, fasten another fitting into the one you are pushing on. Push the hose end firmly onto the fitting. Next, fasten the screws up tight (see top photo). You might test the hose next, to look for any other problems, than drain and coil it. or you might just coil it. We always loosely fasten our hose ends on coiled hoses, to stop mud-dauber wasps from setting up home, and to prevent the washer dropping out. Hose repair complete. Coil the hose and fasten the ends. 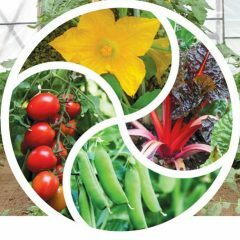 Definitely a skill everyone needs on a homestead–and a good reminder to me to get around to fixing my hoses. Thanks Pam! I’ve fixed hoses many times, but never with these steps to make it work better and last longer. I’m thankful for the post.